We Conduct testing of a wide range ofSalt Spray Test. 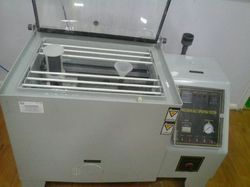 The offered tester is widely used for material testing in modern laboratory. This method is applicable to evaluating the corrosive performance of decorative copper/nickel/chromium or nickel/ chromium coatings on steel, zinc alloys, aluminum alloys, and plastics designed for severe service. It is also applicable to the testing of anodized aluminum. Acetic acid salt spray testing is taking into acoount for the relative resistance to corrosion of decorative chromium plating on steel and zinc best Di-casting when exposed to an acetic acid salt spray climate at an elevated temperature. The salt spray test is a standardized corrosion test method, used to check corrosion resistance of materials and surface coatings. Usually, the materials to be tested are metallic and finished with a surface coating which is intended to provide a degree of corrosion protection to the underlying metal. Salt spray testing is an accelerated corrosion test that produces a corrosive attack to coated samples in order to predict the suitability of the coating in use as a protective finish. The appearance of corrosion products (oxides) is evaluated after a period of time. Test duration depends on the corrosion resistance of the coating; generally, the more corrosion resistant the coating is, the longer the period of testing before the appearance of oxides. The salt spray test is one of the most wide-spread and long established corrosion tests. 17)Tracking index for material group verification etc. Leading IP Ingress Protection Testing Service provider Bharti Automation Nabl ACCridated Laboratory Provide IP Testing Service in all over India. IEC 60529 (IP Code) Water & Dust testing equipment. 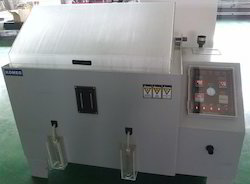 Ingress Protection Test Equipment is used to determine the degree of protection provided by a product enclosure. The level of protection provided by an enclosure is represented by an "IP" code. 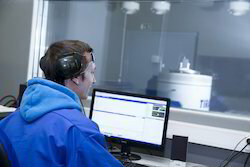 Looking for Environmental Endurance Testing ?